Turok, Son of Stone ran for 130 issues over a 26-year period. Published first by Dell and later by Gold Key, Turok was a Native American from Pre-Columbian times who (along with his young friend Andar) finds himself trapped in a hidden valley populated by cavemen and prehistoric monsters. The Turok stories I was familiar with were set in a valley of apparently infinite size. No matter how far Turok and Andar traveled in their quest to find a way out, they always ran across yet another tribe of cavemen and yet another swamp or desert or patch of jungle they hadn’t seen before. The stories had no internal continuity beyond the characters and settings—the individual issues could be read in any order without changing a thing. This wasn’t bothersome—since the individual stories were pretty cool in of themselves. Like all Dell/Gold Key stuff, they had really nifty, dynamic painted covers (even if the internal art was sometimes mediocre) and the stories were well-constructed and fast moving. And, hey, they had dinosaurs in them. Lots and lots of dinosaurs. But the first two issues of Turok, reprinted together in the Golden Comics Digest, had a definite continuity. Turok and Andar were wandering around the drought-stricken Southwest. Climbing down a deep cave in search of water, they become lost in the twisting corridors. They find a river and, after encounters with piranha and a giant cave bear, come out in the hidden valley. They have a narrow escape from several dinosaurs and soon discover a tribe of cavemen. They also discover the existence of a poison plant and figure out how to extract the poison and coat their arrow heads with the stuff. This gives them an effective weapon of mass destruction against the huge reptiles. They befriend the cavemen and begin teaching them how to use bows. But circumstances lead them to again lose their way in dark caverns and thus lose touch with their new friends. They end up in another part of the valley populated by a tribe of more advanced Indians and animals left over from the Ice Age. (Mammoths, sabertooths, etc.) They end up involved in an adventure with this new tribe and, as the story ends, seem to have found a home among them. Though the characters and general themes were the same as later Turok works, the original story had more of a sense of a coherent epic, with a definite beginning and ending. It didn’t spoil more modern Turok stories for me, but the earlier stuff did strike me (both then and now) as better. The art by Rex Maxon (best known at that time for his work on a daily Tarzan newspaper strip) was effective. There’s a couple of very, very good panels late in the story, for instance, where a wounded mammoth is brought down by a pack of sabertooth tigers. No one knows for sure now who wrote it, but the plot is strong and what little we see of the cultures of the valley tribes is interesting and well-thought-out. Turok and Andar are forced to use their brains as well as their skill as archers continually through the story, making them very interesting protagonists. I’ve never had opportunity to read the very early stories from when Turok got his own regular series after the initial two books. From an internet site about the character, I’ve learned the book continued with this continuity for at least a couple of more issues, then the two protagonists began their endless quest across the now infinite valley. Perhaps this was necessary—if the valley remained of reasonable size and population, the writers would run out of interesting story fodder long before a quarter century had passed.. And, of course, the book always remained fun. But a part of me will always remain fond of the Turok story that never was—where perhaps an earthquake opened the two sections of the hidden valley to each other; the dinosaurs began to intermingle with the Ice Age monsters; and the cavemen interact with and perhaps even go to war with the Ice Age Indians—all with poor Turok and Andar trapped in the middle. Not many people remember Boston Blackie today. That's a pity, because he was a fun character who headlined some really entertaining movies. He was played by actor Chester Morris (that's him on the right) in 14 films during '40s as a man who really enjoyed life and kept his head in dangerous situations. Like the Lone Wolf, Blackie was a reformed thief who would inevitably end up having to catch a murderer in order to clear himself or help a friend. Obviously, the format for the Blackie films was, in general, the same as the Lone Wolf films. The Blackie movies, though, are a little better. Though Warren Williams did a good job as the Lone Wolf, Morris is a model of affability as Boston Blackie. He's just plain fun to spend time with. It's interesting to note that we're never told just how either the Lone Wolf or Boston Blackie can afford their rich life styles without holding down a job. Are they living off the loot from their neferious pasts--despite having otherwise gone straight? I suppose we're not meant to ask. I'm going to sound like a broken record on one point as I continue to post about the B-movies from this era. The Boston Blackie movies were very well-constructed stories that move along quickly without any extraneous subplots. You didn't have to worry about Blackie having any dark secrets or unresolved angst. He just cracks wise and outsmarts crooks. It's important that his character be likable, but at the same time, he exists primarily to serve the plot. It all makes for a very satisfying movie series. It's always a pleasure to run across an old black-and-white movie or movie series that I wasn't previously familar with. In this case, it's a series of movies from the late 1930s & 1940s starring Warren Williams as "The Lone Wolf," a reformed thief who now spends his time as a gentleman of leisure catching criminals. The detectives of the B-movies of that era present us with some of the most purely entertaining films ever made. They feature likable protagonists and good plots. They were usually short--65 to 75 minutes long--and no time was ever wasted getting to the story and telling it well. That was it. Plain good storytelling. Some were better than others, but I have yet to run across a B-movie detective with whom I didn't enjoy spending my time. The same is true with many of the B-movie Western characters. 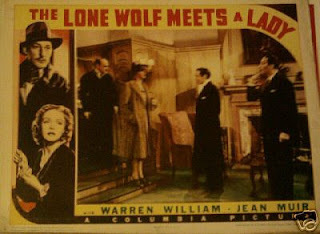 "The Lone Wolf" movies actually go back to the silent days, and continued on to the late 1940s, with the character later being played by Gerald Mohr (who also portrayed him in a short-lived radio series). Recently, Turner Classic Movies ran a bunch of the Warren Williams entries. Since I don't own one of those new-fangled television machines, one of my co-workers recorded three of the movies for me on DVD-R. I watched them over the Thanksgiving break. 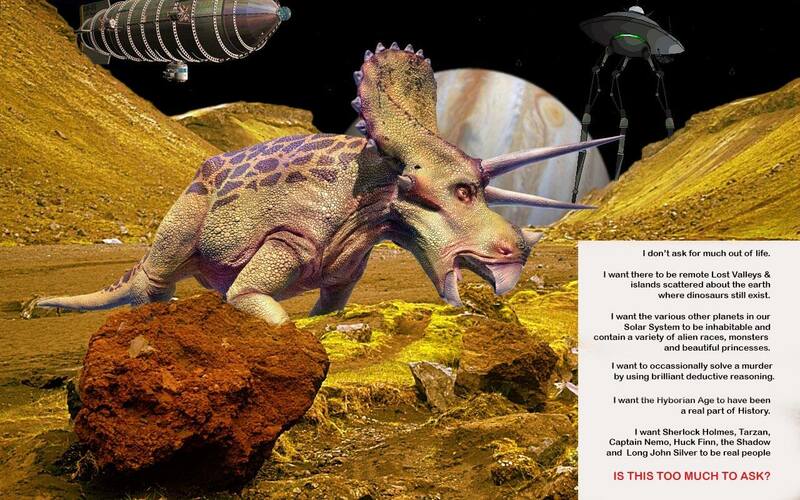 All three were great fun (though a major plot hole mars one of them.) The best of the three I saw was The Lone Wolf Meets a Lady, in which he does just that. This lady, though, has just been framed for murder. Being the nice guy he is, the Lone Wolf helps to catch the real killer and thus save the lady. He himself has to go on the run while doing so--because of his neferious past, the police are always pretty quick to presume that he shares in the guilt of any crime committed in his general area. Warren Willaims played the lead with aplomb. The plot was solid, with a really neat twist near the end and clues that had been fairly planted along the way for us all to see. The supporting characters are colorful and the comic relief was reasonably funny. The plot moves quickly and logically--you have to pay attention, but it all makes sense in the end. If you ever find yourself on the run from the cops for a crime you didn't commit, be sure to keep the Lone Wolf on your short list of people to go to for help. Yesterday--November 23--would have been the 120th birthday of the wonderful actor Boris Karloff. Of course, he's best known for the part that gave him fame--Frankenstein's Monster. He played the Monster in three films, Frankenstein (1931), Bride of Frankenstein (1935), and Son of Frankenstein (1939). He was excellent all three times, making us sympathize with the Monster while still bringing across a sense of real menance. But Karloff was great in all his films. I think his best performance is in a 1946 film titled Bedlam, in which he played the corrupt master of an 18th Century London insane asylum. He's the best part of one of the best movies ever--a story that manages to be spooky and intelligent at the same time. Like all the best horror movies of the 1930s and 1940s, it reminds us that it's possible to tell a scary story without grossing us out. Karloff was also wonderful on dramatic radio. He guest-starred many times on the horror show The Inner Sanctum, where he was especially good in the episodes titled "Birdsong for a Murderer" and "The Wailing Wall." He was magnificent playing the villianous Uriah Heep in a Theater Guild on the Air adaptation of David Copperfield. 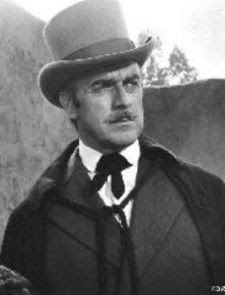 November 23 would also be the birthday of John Dehner. He's one of those character actors who would pop up in a zillion different TV shows and movies during the '50s & '60s, one of those guys you always recognize but can never name, but he really shined on old-time radio. He was in the radio version of Gunsmoke nearly every week, always playing a different role. He might be anything from a uneducated mountain man to a rich cattle baron, but he would always be believable. He played the lead in two old-time radio shows. 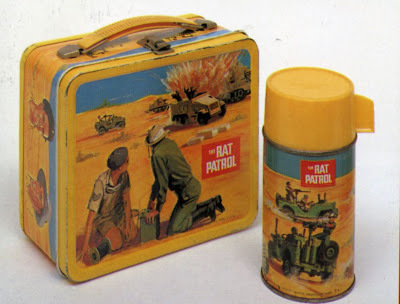 He was Paladin in the radio version of Have Gun, Will Travel (which was a rare case of a show starting on television, then going to radio: it was usually the other way around), but his best show was Frontier Gentleman. In this, he played a reporter from the London Times who traveled the American West in the 1880s, looking for human interest stories. It was a classy, intelligent show with good scripts and good production values. Karloff and Dehner. Two completely different actors who both contributed much of what is worthwhile to our popular culture. Karloff has been gone for four decades now and Dehner passed on 15 years ago, but the great stories they were a part of are still here for us to enjoy. Happy birthday to them both. My next book is going to be about radio shows that were based on literature or popular fiction. That means a large proportion of the book will concentrate on mysteries--Sherlock Holmes, Sam Spade, Nero Wolfe and many other characters who originated in prose had their runs on radio. So did Perry Mason. I've read a number of Earl Stanley Gardner's original Mason novels, but these had been those published in the '40s and '50s. These all followed the standard Perry Mason formula that we're all familar with--his client is accused of murder, he and Paul Drake investigate, then there's a really fun courtroom scene at the climax in which the real killer is revealed. But it wasn't always this way. I had always known that Gardner's early Mason novels were written with a more hard-boiled sensibility, but now I've confirmed that first hand. I just read "The Case of the Velvet Claws" (1933), the very first Mason novel. Here, Mason never gets to court (in fact, he says at one point that his cases rarely get that far). Instead, the book follows a very tough-guy Mason as he deals with a client accused of murder. He beats up a reporter. He carries a gun. He bribes a cop to trace a phone number. He blackmails the head of a blackmail ring. He does do some lawyer stuff, but for the most part, he could have easily been written as another hard-boiled P.I. without drastically changing the plot. In other words, he's nothing like the man he would one day become. In the 1930s, Gardner created dozens of characters for the pulp magazines. He was always a good writer and his early stuff is still fun to read. With Perry Mason, he struck literary gold. But this happened only after he evolved the character from just another hard-boiled guy into the more sedate but still brilliant lawyer he eventually became. As for the radio show--that was, believe it or not, more of a soap opera than a mystery show. It was only when Perry Mason came to television that he was properly treated. And don't think it isn't painful for an old-time radio buff such as myself to have to admit that television actually did a better job than radio. But, in this one isolated case, it's true. So yesterday I had a few errands to run downtown. I don't own a car, so that means taking a bus ride, then doing some walking. But the weather is really nice right now and, of couse, I'd bring my MP3 player with me. While walking along Main Street, stopping at the public library, the comic book shop and an unplanned visit to the ice cream shop for a vanilla milk shake, I listened to an episode of "Academy Award," a show that used to do half-hour dramatizations of movies. 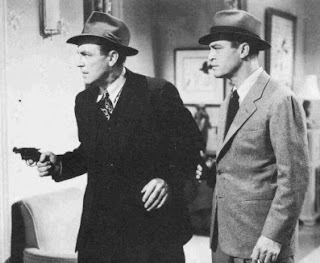 This particular episode did "Foreign Correspondent," with Joseph Cotton playing the role that Joel McCrea handled in the original Hitchcock film. With only 30 minutes to work with, it was very much a "short story" version, with a very different ending to the story. But taken for what it was (a quicker and different version of the same basic plot) it was very well-done. I also listened to an episode of "Gunsmoke." On radio, Marshall Matt Dillon was superbly played by with William Conrad and the scripts were literate, intelligent Westerns. This particular episode involved a beautiful girl working at the Long Branch saloon. It turns out that she enjoyed subtly egging men on until two or more of them were fighting over her. Anyways, in the relatively short time I spent downtown, I also figuratively traveled to Holland and England (and back in time nearly 7 decades) while battling an Axis spy ring. I then jumped back another 7 decades and back across the Atlantic to Dodge City, where I stood with Matt Dillon has he dealt with yet another life-and-death situation. By golly, you can't do that with television and movies--at least not without bumping into things while you walk. By the 1950s, storytelling on the radio had hit a creative peak. Expert writers, directors and actors were putting several decades of experience to good use, turning out superb stories in a number of different genres. Westerns, hard-boiled detectives, adventure—all were being represented by intelligent, entertaining shows such as Gunsmoke, The Adventures of Sam Spade and Escape. Science fiction was well-represented as well, especially by Dimension X and later by X Minus One. Dimension X ran from 1950 to 1951, adapting stories from Astounding Science Fiction magazine. In 1956, the same producers and writers revived the show as X Minus One, still doing adaptations of stories by some of the best science fiction authors active at that time. One of the things that made these shows so good was that they never wrote down to their audience. If the show dealt with a difficult concept, it still expected the listeners to be bright enough to follow along. Also, they adapted the stories very faithfully, usually making only those changes necessary to make it work dramatically on radio. They did a lot of Ray Bradbury stories, but also did Asimov, Heinlein, Jack Vance and others. One of my favorites is "A Gun for Dinosaur," based on a L. Sprague de Camp story and broadcast on March 6, 1957. It's about a big game hunter who leads safaris back in time to hunt dinosaurs. But if you take someone back to hunt a T-Rex, make sure he's big enough to handle the high-caliber gun he'll need to use. The original story is constructed around the lead character, Reginald Rivers, telling the story of the hunt to someone at a bar. This is a perfect way to realistically introduce him as narrator and the radio adaptation keeps the same structure. Also, all the little bits of characterizations that make the finale so effective are kept in place. Even little bits of dialogue that don't relate to the main plot, like a campfire conversation about how a museum once set back a team to catch a brontosaurus, are kept in the radio play and manage to add to the overall verisimilitude of the story. It's great stuff—a prime example of just how good old-time radio could be. Pierre Le Grand ("Peter the Great"--his real name is unknown) was a Frenchman who, around 1620, took 28 men out into the Caribbean in a small boat, determined to make a go at piracy regardless of his lack of a real ship. They'd been at sea awhile, with food running short and the boat in bad shape, when they finally spotted a large Spanish galleon. Le Grand decided to board her. His men swore an oath to fight to the death, but Le Grand drilled a hole in the bottom of the boat regardless. They would have to win or die. They came up to the ship in the dark and climbed aboard, each man armed with a cutlass and a pistol. They caught the captain and some others in a cabin, playing cards. Some of the crew tried to defend the gun room, but were quickly killed. The ship was quickly in the hands of the pirates. Le Grand kept enough Spaniards aboard to work the ship, put the rest ashore and sailed for France. Peter Le Grand's career as a pirate was short, but very successful. Man, this movie, made in 1942, is just plain cool. Bogie and his cronies are gamblers who might have been drawn straight from a Damon Runyon story—the sort of mildly illegal people who might gamble and occasionally cheat a little, but never actually seem to hurt anyone. Bogie’s character is “Gloves” Donahue, who concentrates on his own business regardless of what else might be going on in the world. The war might be raging in Europe and the Pacific, but Gloves makes it clear that he’s not interested in anything military—that’s “Washington’s racket.” Gloves is more concerned about the odds on that day’s Yankees game. But when the baker who makes Gloves’ favorite cheesecake is murdered, he finds himself up against a gang of Nazi saboteurs. Soon, he’s been framed for murder and must dodge the police as well as foreign assassins. Along the way, Gloves has an epiphany and realizes that the fight for freedom is everyone’s responsibility. New York gangsters vs. Nazi spies. Now that’s cool. It’s a fun, fast-moving story, adroitly balancing action, suspense and humor. There’s several nifty and well-choreographed fist fights, a secret headquarters, a beautiful girl with uncertain loyalties and a never-ending supply of one-liners. As with many movies made during the war, the patriotism is laid on thick. But good acting and a good story keeps it from being unpleasantly corny and even reminds us of some of the basic truths of healthy and thoughtful patriotism—there are some things worth fighting for. I’m not going to argue the movie is philosophically important, though. Watching it now, two generations after it was made, we mostly just enjoy the sheer sense of fun All Through the Night so expertly generates from beginning to end. In 1947, artist/writer Carl Barks created Uncle Scrooge McDuck in story called "Christmas on Bear Mountain." The wealthy but incredibly stingy Uncle Scrooge served as the plot device to set up an adventure for Donald Duck along with Huey, Dewey and Louie. But Scrooge struck a chord with readers. Barks took the character and ran with it, creating some of the most imaginative and entertaining comic stories from the late Forties and throughout the Fifties. It took a few tries to refine Scrooge's character. An early story, "The Magic Glass," told us that Scrooge's wealth comes from owning a magic hourglass. Though this is a wonderful story (involving an adventure in the Sahara Desert to retrieve the hourglass after it is stolen), Barks soon set this idea aside. Scrooge, it eventually developed, had earned every single penny now sitting in his impregnable Money Bin through hard work. He'd been "tougher than the toughies and smarter than the smarties." And though now getting on in years, he was still tough and smart. In story after story, he protected his wealth from thieves such as the Beagle Boys or took Donald and the nephews on wild adventures in search of hdden treasures. "Back to the Klondike" (Four Color Comics #456, 1953) is one of the best Scrooge stories, highlighting all the important aspects of Scrooge's personality withn the context of yet another entertaining adventure. As the story opens, Scrooge is having serious memory problems, even forgetting who Donald is. A doctor prescribes memory pills, which work so well that Scrooge remembers a cache of gold he'd buried in the Klondike years ago when he first struck it rich as a prospector. So Scrooge, Donald and the nephews are off to the Klondike to recover the gold. 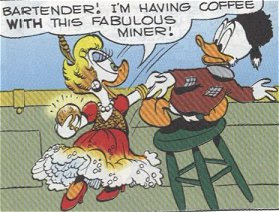 Over the course of the story, we meet Glittering Goldie, a former saloon owner with whom Scrooge developed a love/hate relationship during the gold-rush days. There's a series of gags based on Scrooge's refusal to take his memory pills (hey, they cost a whole ten cents each---they're too valuable to swallow) and a set of mini-adventures involving a grizzly bear and a swarm of mosquitoes. We get a flashback to Scrooge's days as a young prospector (and a nifty sequence in which we get to see him whip a dozen or so guys in a barfight). We get examples of Scrooge's greed and penny-pinching, but also an ending that shows he has a heart of gold hidden under his tough exterior. What's really good about this story (and about the bulk of Barks' work on Scrooge and Donald Duck) is the bizarre thematic balance struck by these stories. On the one hand, these are "funny animal" stories, with talking ducks and dogs involving one sight gag after another. On the other hand, Barks' art was, well, realistic and the sense of real adventure he maintained was always palpable. The stories are both funny and exciting. The characterizations are both comedic and (on occassion) genuinely emotional. "Back to the Klondike," recently reprinted in a trade paperback and so easily available, is one of the best examples of this. In an industry that has given us the work of so many talented artists and writers, Carl Barks holds a comfortable spot amongst the best of the best. He, like Scrooge, was tougher than the toughies and smarter than the smarties. SIDENOTE: The trade paperback "The Life and Times of Uncle Scrooge," by Dan Rosa, is a series of 12 issues dealing with key moments in Scrooge's life, from when he earned his first dime as a shoe shine boy in Scotland to his first adventure side-by-side with Donald and the boys. Rosa took hints dropped by Barks in various orginal Scrooge stories to fill out the old skinflint's biography. Rosa is a worthy successor to Barks, with the same talent for balancing humor and adventure. This is one of the best trades ever and should be considered required reading. My first book was published in May 2004. Its title is a long one: Storytelling in the Pulps, Comics and Radio: How Technology Changed Popular Fiction in America. I love reciting that title to people when I tell them I've been published--I get these absolutely blank looks 85% of the time when they try to figure out what the heck it must be about. The title says it all, though. It's an exploration of how new technologies (and changes in society that came from technological advances--such as an increase in literacy) created new ways for stories to be told. I concentrate on media that have since been largely supplanted by television and other even later tech advances: old-time radio, adventure comic strips and pulp magazines. It's not a heavily academic work, though. I wrote it in a conversational and often (hopefully) humorous style. People seem to have enjoyed reading it. It's a tad on the expensive side, but a lot of libraries around the country have it. If your library doesn't have it, request that they do. It's the cheapest way to get your hands on it. Of course, if you want to buy it and line my pockets with another dollar or two, feel free to do so.